Heat oven to 250ºF. In 15x10x1-inch baking pan with sides (jelly roll pan) or large roaster, mix cereals, pretzels, cashews, raisins and cranberries. In small bowl, mix remaining ingredients. Pour over cereal mix; stir to coat well. Bake 1 hour, stirring every 15 minutes, until crispy and well coated with seasoning. Spread on waxed paper or cooking parchment paper to cool. Cool completely, about 10 minutes. 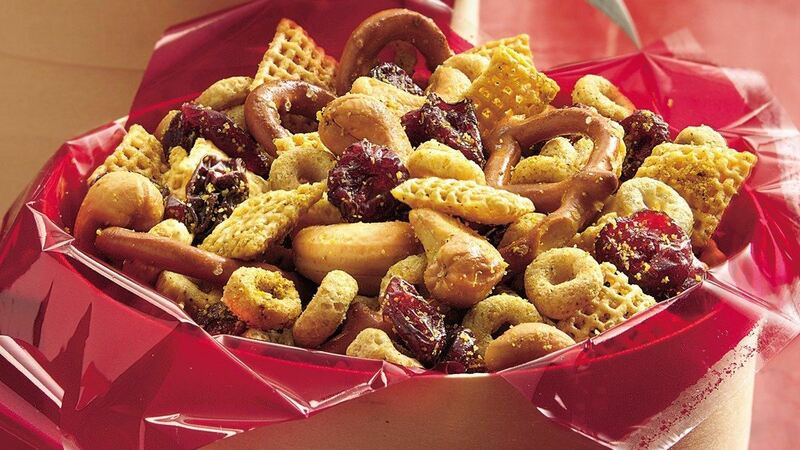 Special Touch: For a great hostess gift, fill a cellophane bag, decorative jar or tin with the snack mix. Tie with a festive ribbon and add a handwritten label.